Harvard Book Store welcomes NICK MONTFORT, associate professor of digital media in Comparative Media Studies/Writing at MIT, for a discussion of #!, World Clock, and 10 PRINT CHR$(205.5+RND(1)); : GOTO 10. #! (pronounced "shebang") consists of poetic texts that are presented alongside the short computer programs that generated them. The poems, in new and existing forms, are inquiries into the features that make poetry recognizable as such, into code and computation, into ellipsis, into ways of representing ?, and into the alphabet. Computer-generated poems have been composed by Brion Gysin and Ian Sommerville, Alison Knowles and James Tenney, Hugh Kenner and Joseph P. O'Rourke, Charles O. Hartman, and others. The works in #! engage with this tradition of more than 50 years and with constrainted and conceptual writing. The book's source code is also offered as free software. All of the text-generating code is presented so that it, too, can be read; it is all also made freely available for use in anyone's future poetic projects. World Clock tells of 1440 incidents that take place around the world at each minute of a day. The novel was inspired by Stanislaw Lem’s “One Human Minute” and Harry Mathews’s “The Chronogram for 1998.” It celebrates the industrial concept of time and certain types of vigorous banality which are shared by all people throughout the world. This novel was generated with 165 lines of Python code, all of which were written by the author in about four hours on November 27, 2013. The only external data source that is used in the generation process is the computer’s time zone database. The source code is available under a free software license at http://nickm.com/code; anyone is welcome to use that code to generate their own novel or for any other purpose. World Clock was generated as part of the first "NaNoGenMo" or National Novel Generation Month, which was declared on Twitter this year as a response to, and alternative to, the better-known NaNoWriMo (National Novel Writing Month). This book takes a single line of code--the extremely concise BASIC program for the Commodore 64 inscribed in the title--and uses it as a lens through which to consider the phenomenon of creative computing and the way computer programs exist in culture. The authors of this collaboratively written book treat code not as merely functional but as a text--in the case of 10 PRINT, a text that appeared in many different printed sources--that yields a story about its making, its purpose, its assumptions, and more. They consider randomness and regularity in computing and art, the maze in culture, the popular BASIC programming language, and the highly influential Commodore 64 computer. 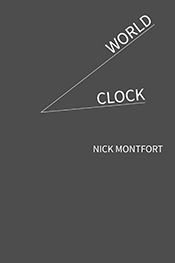 Nick Montfort is the author or editor of fifteen books, including books of poetry, several collaborations, and several artist's books. Five of his previous books are of computer-generated poetry and include The Truliest (Counterpath Press, 2017), #! (Counterpath Press, 2014), 2x6 (a multi-lingual collaboration, Les Figues, 2016), and Autopia (Troll Thread, 2016). He is a professor of digital media at MIT and lives in New York and Boston.